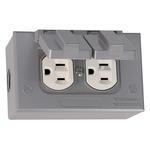 RV Electrical Service is available in Building 3 only and is optional. It is limited to low amperage uses like charging batteries and running lights. Spaces from 35'Lx18W to 50'Lx18W. May join multiple spaces together for more square feet space. 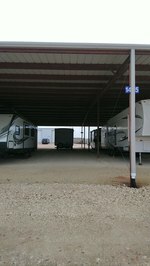 Covered RV space, 45 long x 15 wide x 21 high. Spaces are covered but not enclosed. Some spaces have electrical available. Minimum one year lease requirement. Open numbered spaces are available in the back of our facility. If we are full on RV Covered or Enclosed spaces you can lease one of these and be the first offered any openings! Spaces are on packed and rolled base material for all weather access. Minimum 3 Month payment and lease requirement. Trade spaces are fully enclosed and have a 3' man door and 12'x14' roll up door. They are available individually and may be grouped by widths. For instance you may be able to get a 40'Dx50W space with 2 man doors and 2 roll up doors. The spaces are fully wired with lights and quad plugs. Electricity not included. Minimum 1 year lease requirement. Gated yard. Size is approximate. Available only to Enclosed Trade Space occupants. Yards all have 6 foot fence with 3 strand barbed wire on top. All have locakable drive through double gates. Minimum one year lease. North Building with 2 Door Garage Bay, Office, and bathrooms. South Building with 4 Door Garage Bays, Office, and bathrooms. Middle Front Building with 2 Door Garage Bay, Office, and bathrooms.